Up to the rollout of Nextdoor offers there was no way a business could post anything on Nextdoor, not even an event. To post a business event you had to use your personal Nextdoor profile to do it. Exciting news because this is the first feature just for businesses to actively post something so neighbors can see a message from your business. It’s not just any type of message that you can post, though. 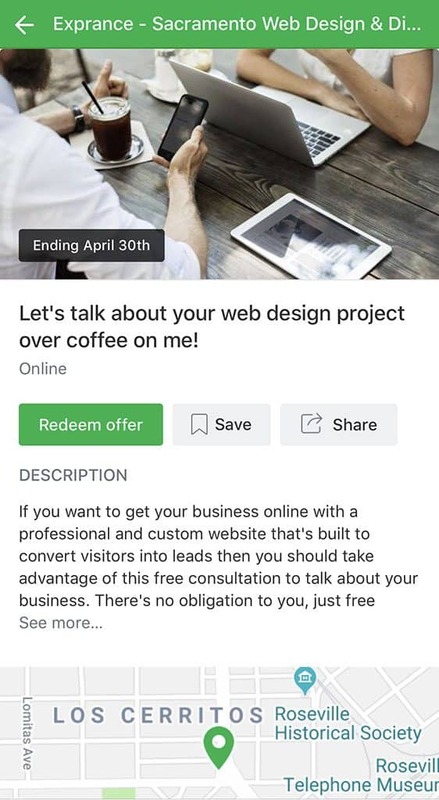 Right from your business page you can post an offer from your business. It may not be rolled out to every business yet because it’s still in the pilot stages but it’s coming. Nextdoor has a promotional page for offers on their website but it simply asks you to sign up for Nextdoor. There’s no information yet on what areas actually have access to offers as it is still in pilot as of April 2019. Luckily I am in the pilot group (or maybe everyones is, who knows!?) so I put together the whole process of creating an offer and what they look like on Nextdoor. As with most things online, people will try to abuse offers. Thankfully Nextdoor has been good up to now policing the abuse that business owners throw at it. Nextdoor isn’t a medium for you to spam your neighbors about your latest greatest business venture. Keep this in mind before you start posting several offers a week: it’s not about you, it’s about your neighbors. That means offers should be focused on the benefit for your potential customer rather than about spreading the word about your business. 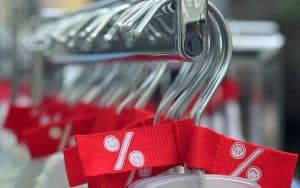 Businesses can only post about discounts and promotions. If you post anything else your offer will likely get removed and if you continue to violate the rules your business may get banned. Offers still must adhere to Nextdoor’s community guidelines. Businesses can only post for their own business, not offers promoting another business or partner. It’s still in the pilot stages so by posting an offer you’re agreeing to provide feedback about offers. My guess is their purpose here is to fine tune it so they can eventually monetize it. 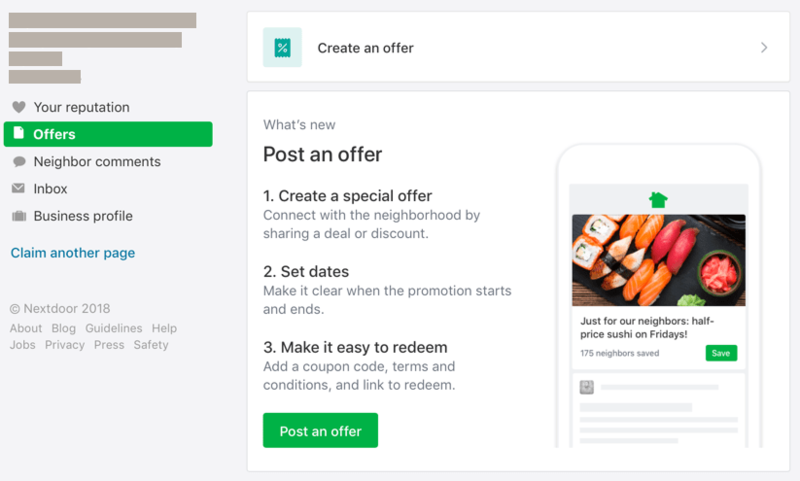 Nextdoor has a lot more information about the rules and best practices for offers, I recommend reading them thoroughly before you start posting. Now for the good stuff when you’re ready to post your first offer. How Often Can You Post Offers? That’s the top limit for posting offers but unless you have something really compelling to post more often than ever week or two, I wouldn’t even recommend two per week. If you’re posting the same offer twice a week and people stop responding to it, stop. At that point you’re annoying your neighbors and nobody is going to want to do business with that guy. My recommendation for really good promotions is for them to last a week for the most part and if you’re getting responses then continue until it stops. It’s also a good idea to switch up your offers every week and post something different. Offer something new, great, and unique that captures attention. It’s time to post your first offer on Nextdoor. I would recommend you do this from a computer and even there it’s still a bit rough around the edges. I found that I had to switch to my profile a few times during the process of setting up my offer. You can get acquainted with switching pages/profiles and checking that you’re in the right one on this Nextdoor help article. Now it’s time to share something special with your neighbors that they’re going to love. 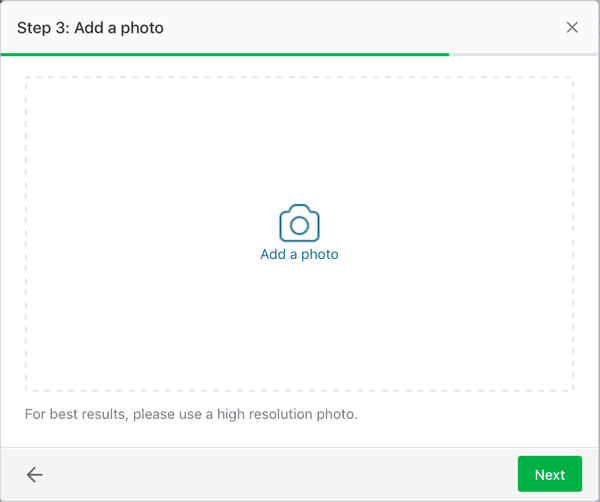 The first step starts in your Nextdoor business page. 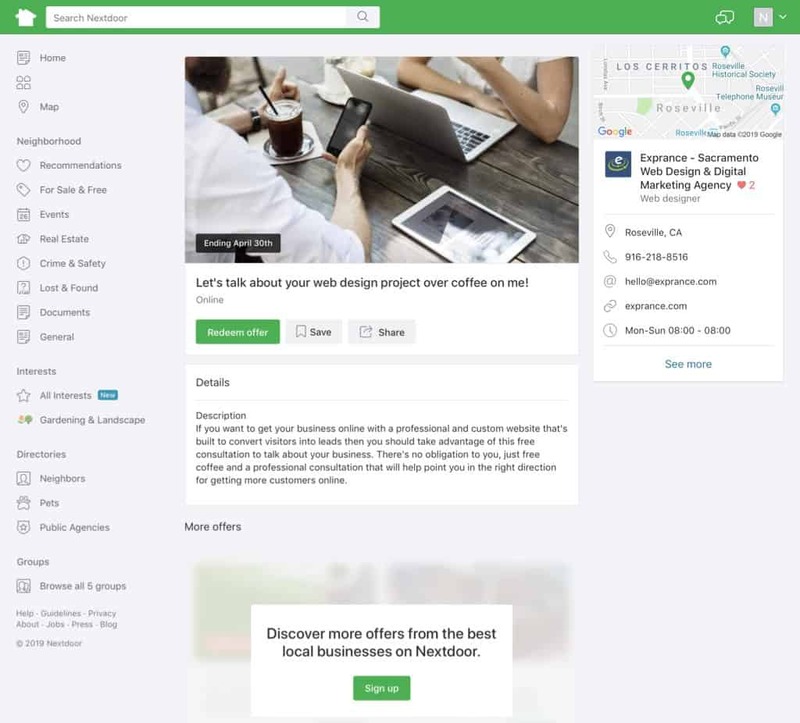 If you don’t have your Nextdoor business page set up then you should set up your business page first or have us set your business page up for you. 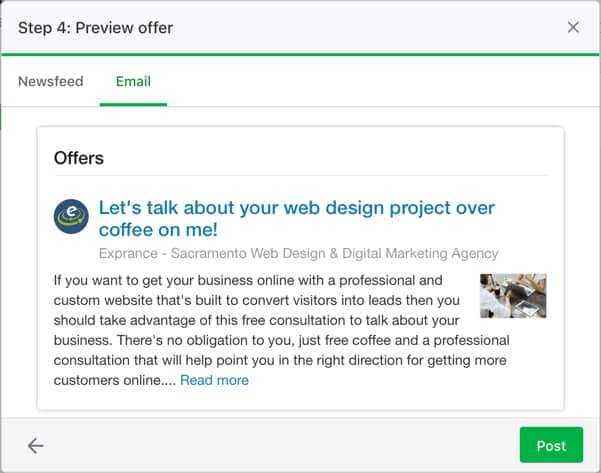 From your business page there’s a new Offers tab, in there you can learn about offers and create your own offer. 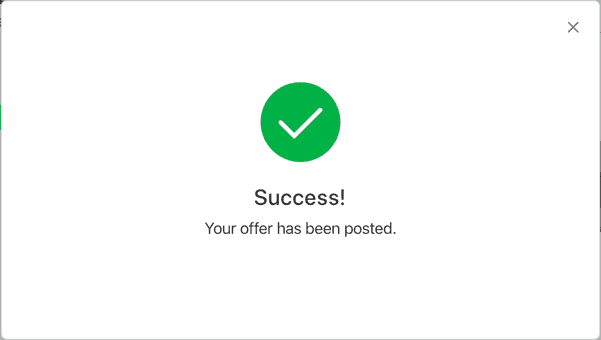 To create your first offer, click the Post an offer button. I know, I’m not exactly in sync with the Nextdoor steps. This isn’t only the offers steps, though, it’s the whole process before and after. This is where the bulk of your offer is written and what you need to spend the most time on. Make sure your offer is something genuinely special that will attract attention. The offer I saw do the best and get the most response is a complimentary appetizer in the lounge of a restaurant. It was miles above the 15% offs and generic promotions with no special offer. Give something cement, something free, something that people will genuinely like. Remember, this isn’t about you and making a huge sale that’s worth tons of money to you (15% off kind of says hey I want to give you a tiny bit off but I still want to make a ton on this offer). Offering something really great is key. Headline: Tell someone right from the headline what it is you’re offering. If someone has to tap on the headline to see the full offer then you lost them. 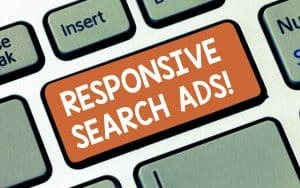 Spark their interest with a catchy headline that tells them what to expect from the offer. You can find some great examples of effective headlines that Nextdoor put together. Details: Sum up the headline with more details about the offer, explain how they can redeem the offer in more detail than what’s coming next, and tell them why they should redeem the offer. Expiration: Every good thing must come to an end and that goes for an offer too. It could be an ongoing offer but don’t try to put the deadline 2 months out, there’s no sense of urgency there. Put a limit that’s coming up and post your offer again if it continue to go on. Terms and conditions: Who can redeem it, what exclusions may apply, etc? Coupon code/website: You can select whether their’s a coupon code or on a website. You can even choose both if either/or will work. If they must use a code in the store then put that here. Make sure everything is in its place so people know what to do and by when. 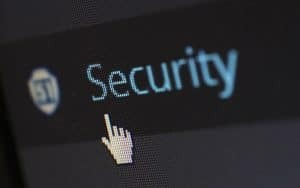 If you’re putting in a website, make sure the website URL you type in goes to a page specifically for that deal with information about it. Don’t put your home page URL in because you’re just going to confuse the user and nobody’s going to redeem your offer. Now to the next section of the offer. You can post your offer to individual neighborhoods that you have access to or you can post to them all. If you want to reach the maximum audience then I recommend you leave the defaults selected and then continue on. 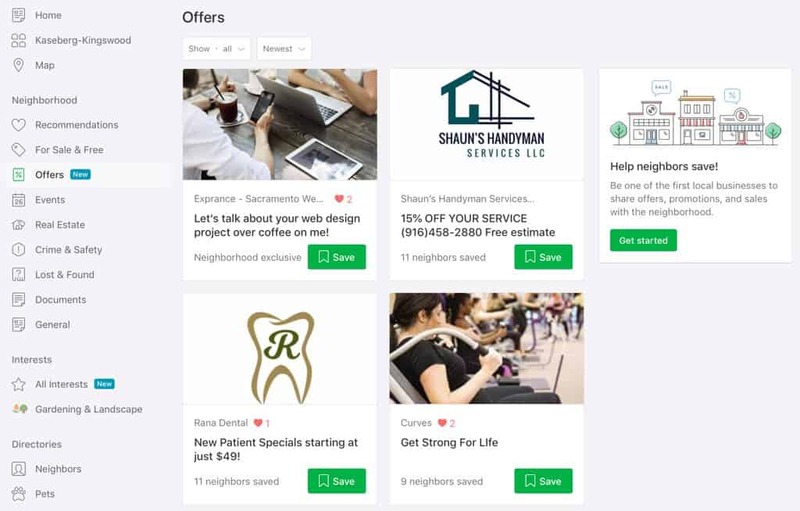 You can see there’s an overview of how many neighbors might see your offer in each neighborhood and then the overall number. That’s a lot of neighbors! Now to make your offer really pop and capture attention. You don’t have to add a photo but consider it a requirement. 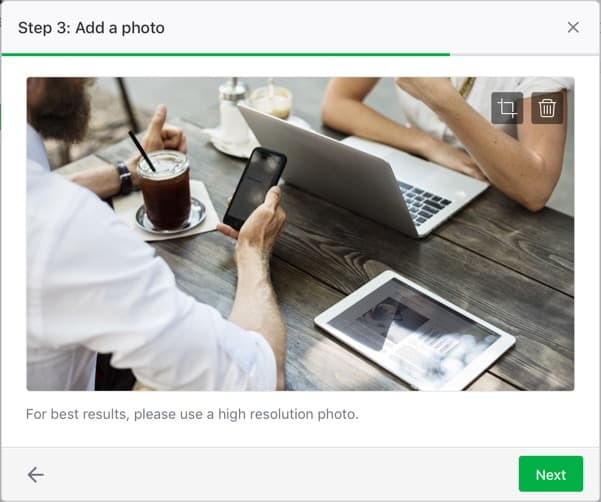 Your offer will get lost on a screen of other offers if you don’t include a captivating and relevant photo. You can find lots of great high resolution photos online that are OK to use for businesses. Just be sure the license is good for commercial use. Just drag your photo over to the box or click on the box to pull up the file browser. And here’s what you’ll have once you upload your photo successfully. This is me actually posting an offer by the way. Now you’ll want to make sure your offer looks good and will make sense to someone seeing it who has no idea who you or your business is. Read over it very carefully, think about the offer and how it might appear to others. You may even want someone else to look at it for you. Don’t take this review step lightly though if you want to make a good impression on neighbors and get some traction with your offer. Check both tabs (newsfeed & email) where your offer might be seen. Different information is shown in each one so be sure you put equal attention to reviewing them both. When you’re sure everything is looking good then you can post your offer! Now that you’ve clicked the post button you get a confirmation that your offer has been posted. There’s a tiny little X in the top right corner of that box that you can click. When you click the X Nextdoor brings you to your offer but you’re not in your profile, you’re in some weird halfway profile (or at least I was) that didn’t show that I was logged into Nextdoor. That’s where I had to switch profiles to see my offer displayed in the offers tab of my business page. Now that you’ve posted your offer on Nextdoor it’s time to verify it’s posted everywhere it should be and take one last glance over to make sure it looks good. As new offers are posted on Nextdoor the old ones get pushed further down the list. That’s part of the reason you should refresh your offers on occasion after the old one has expired. If you’re on the Offers tab in Nextdoor your offer will look like these. Neighbors can save the offer or click on it to learn more. See the little red heart with the number? Those are the number of recommendation your business page has. That means getting good recommendations is more important than ever on Nextdoor. 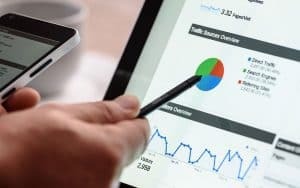 Your business offer is going to stand out significantly more with recommendations and it also builds trust with your neighbors who are looking at offers. Once a neighbor clicks into your offer they see all the juicy details. This even includes information from your business page. See those recommendations again? They really stand out and add another dimension to your business. Below your offer you’ll also see other offers from neighborhood businesses. And here it is on mobile. As you’ve seen it’s easy to post Nextdoor offers to tell neighbors about awesome things you’re doing. They are also a tool that can be misused as a tool to spam neighbors. Of course the spammer never understand the harm they’re doing to their own business, they simply want to tell everyone about what’s important to them. 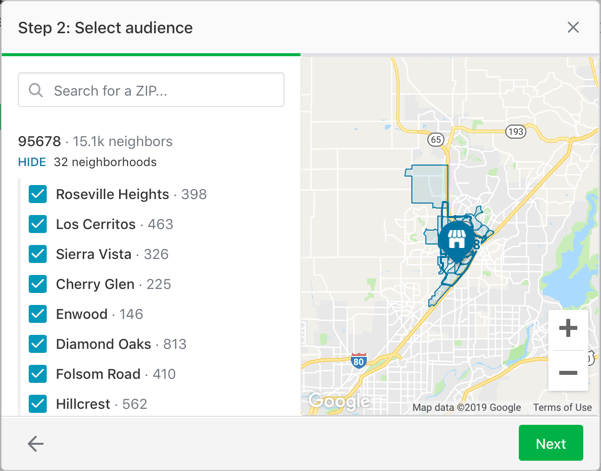 Make sure you’ve read this blog post about Nextdoor offers so you understand how they work and how you should approach them. Nextdoor also has a lot of helpful information about offers, read it. Balancing your excitement about your business with a focus on how it benefits your neighbors is key to success. 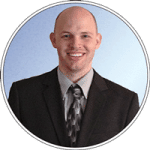 With the right approach you can be very successful in driving more customers to your business. 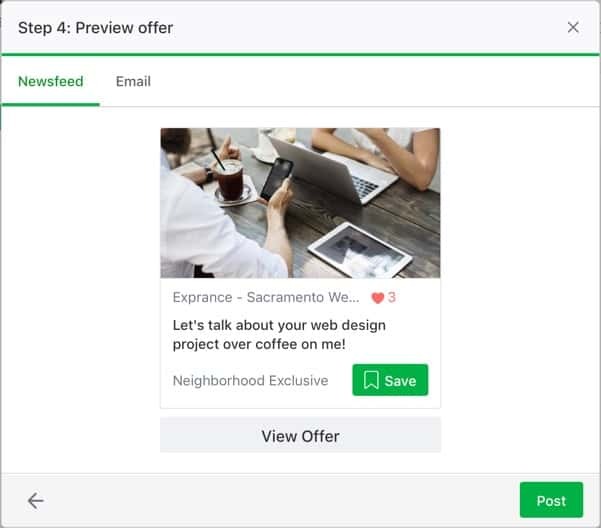 Offers is an exciting new medium for promoting your business on Nextdoor beyond simply creating your business page. Of course recommendations are still extremely important so it’s important to get some recommendations first so your offer is trusted. You can use this free email template to get more recommendations for your business. 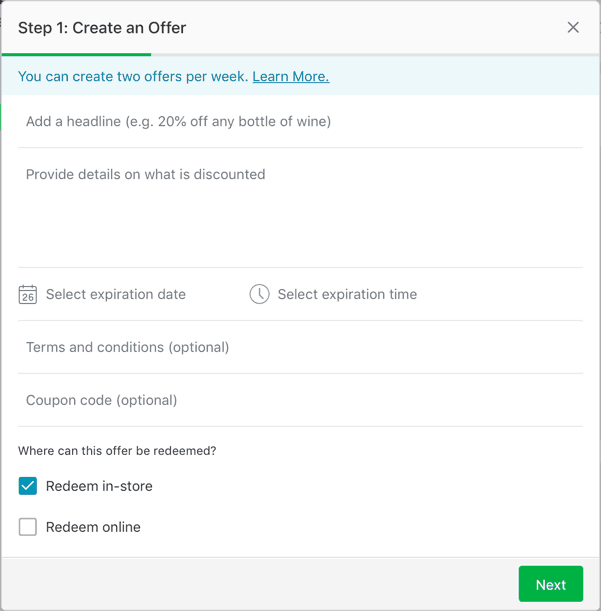 Even though offers is the newest way to promote your business on Nextdoor, events may still be an extremely important method for some businesses, especially when putting on an event. Go forth and offer the best offers and help your neighbors discover new great things that will benefit them greatly. Remember, focus on their benefit rather than yours. 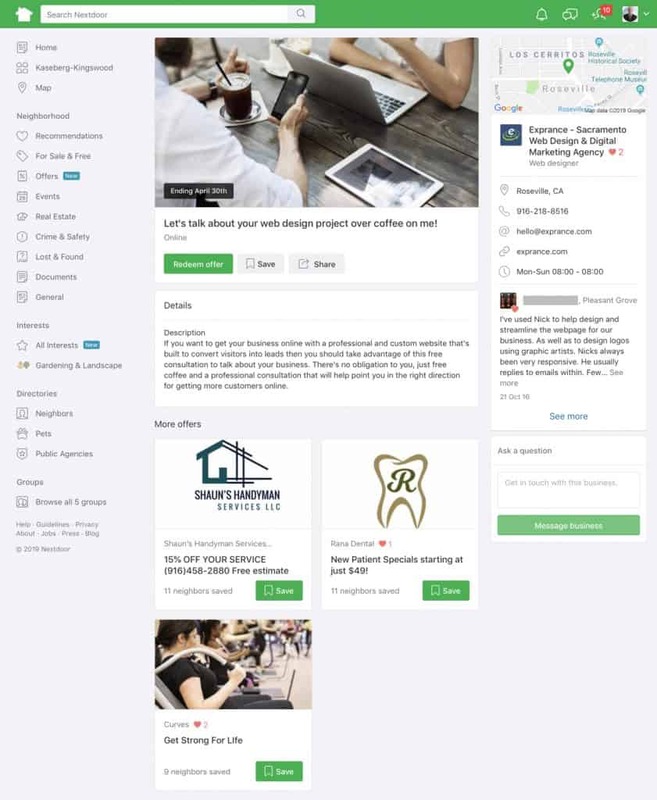 Want Us To Set Up Your Nextdoor Business Page?